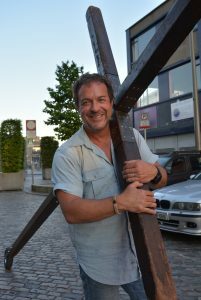 Keith Wheeler with his cross in Smithfield, Dublin. Pic: Sarah Mac Donald. 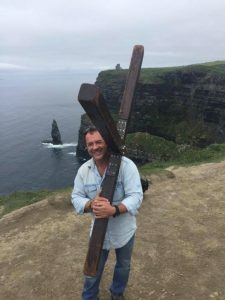 An American father of five who has carried a 12-foot wooden cross through 176 countries on all seven continents, facing down firing squads, venomous jungle snakes, and members of al-Qaeda got a rather unusual welcome in Ireland last week. “I am not here promoting another religion, organisation or charity – I am promoting a message of love on the roadsides,” he told CatholicIreland.net. Three years ago he carried his weighty cross to the top of Mount Kilimanjaro with his wife, Nicole, a schoolteacher and marathon runner. His pilgrimage has taken him to places like Iraq, Iran, Tibet and China, as well as nations at war, including Bosnia and Rwanda during the genocide. He has even brought his cross to Antarctica. He has been arrested over 40 times by authorities unnerved by his pilgrimage, and in the US state of Louisiana he was beaten and left for dead. To his list of incredible experiences in remote and dangerous spots around the world he can now add an Irish tale of welcome, which saw the patrons of three packed Dublin city centre pubs come out to greet him and, in one case, insist that he bring his cross inside. The 57-year-old, who bears a resemblance to Bruce Springsteen, told CatholicIreland.net that though he doesn’t drink, he was bought six pints of Guinness. He spent time with the “heaps of homeless people” he came across in the capital and he also brought his cross to Glendalough and the Cliffs of Moher, where tourists from places like India, France, Switzerland and Nigeria thronged to talk to him. Praising Ireland for being open and welcoming to the stranger, he said that “There is a right way and a wrong way to do it and Ireland seems to have done a very good job so far. Speaking in the wake of the atrocity in Manchester, he said the challenge today was to build bridges and dialogue.